The Town of Unity was formed from Albion and Sumner Townships in 1877. A number of claims were taken in 1856 . The first two settlers were Dennis Lawler and PB Williams who settled near the Buffalo river in 1859. The real influx of settlement came in the 1870s. Some of the early pioneers were Esten Johnson, Ole E Johnson, Engebret Pedarson, Anders Larson, Even Evenson, Martin Rognlien, Simon Rise, John Rise, Ole Svendson, Peter Inislund, Ole Dahl, Paul Christianson, Hans Paulson, Martin Olson and Andrew Call. 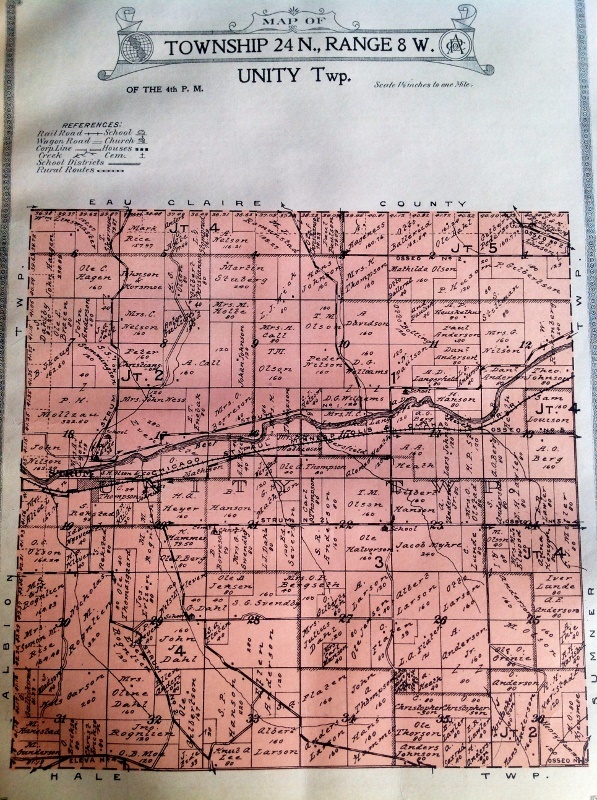 According the the 1917 History of Trempealeau County,’ Dennis Lawler wanted the Township named after him but PB Williams wished to call it ‘Unity which was the name of the town in Maine from which he had come. Upon the suggestion of Noah Comstock (of Arcadia) the matter was decided by lot and Mr Williams drawing the longest cut named the town Unity.’ Strum was named by Congressman William T Price for his friend, Louis Strum of Eau Claire. At first the village was called ‘Tilden” after Samuel Tilden, ( politician) but on Jan 1, 1890, the name became officially ‘Strum”. 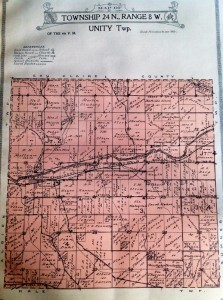 the map above was printed in 1914.